Federation University Australia > Current students > my Student Centre and InPlace > How to use my Student Centre (mySC) > How do I enrol into an online class when I am an on-campus student? 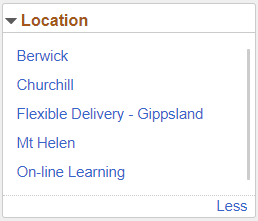 When you are in mySC enrolling, the default location will be your normal study location, for example a Mt Helen student will have Mt Helen as their Location. Click on the Filters icon. 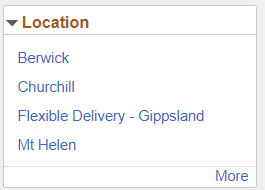 To enrol in classes which are being offered online you will need to click on the Location filter. The filter will be applied to your search results. 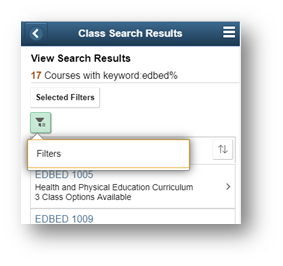 Note you may need to click on the x button against other filters applied to your search. Note that in your Timetable, the online course will not have a class schedule and will display as TBA. If you have any further issues with enrolling, please contact Student HQ. If you are an online student and want to enrol in an on-campus class you will need to contact Student HQ to enrol.